Lady Faatima Ma'sumah (s.a) was the daughter of the 7th Imam, Imam Musa Al-Kadim (a.s) and the sister of the 8th Imam, Imam Alee Al-Rida (a.s). She was a noble lady who dedicated her life to Islam and Allah (swt). She was highly gifted, and due to the training of her father and brother, she has achieved a high reputation in history for her knowledge and piety. She was only six years old when her father was arrested by Harun (the 6th Abbasid Caliph) and thereafter, she was brought up under the care of her brother, Imam Al-Rida (a.s) for twenty-one years. 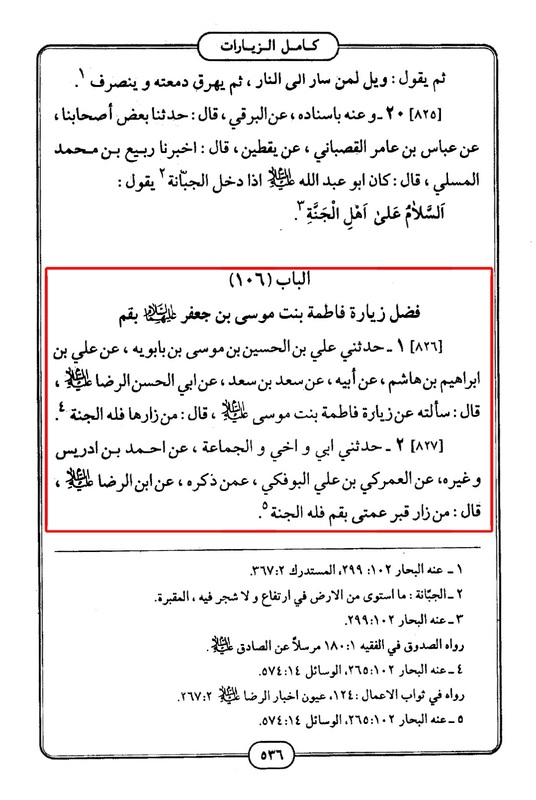 In the year 200 A.H, Ma'mun (the 7th Abbasid Caliph) forced the Imam (a.s) to move from Madinah to Khorasan in Iran. And so, Lady Faatima Ma'sumah (s.a) was once more separated from her guardian. In the year 201 A.H, she decided to leave Madinah and travel to Khorasan to be at the side of her brother, intending to help him in his mission to preach Islam. But regrettably, she never reached him. The caravan that she was travelling with, was ambushed at Saweh, where she had to witness the brutal killing of her close family members. As a result, she can be compared to Lady Zaynab (s.a), who suffered a similar plight in Karbala. Lady Faatima Ma'sumah (s.a) was taken ill at Saweh. From here, the Shi'a of the nearby Qum brought her to their city where she spent her last few days before passing away during the month of Rabi Al-Thani in 201 A.H.
Lady Faatima Ma'sumah (s.a) is buried in Qum, Iran. Due to her blessed presence and patronage, the city has grown into a centre of Shi'a learning; a destination for thousands of Muslim students from over 80 countries. Source: 'Lady Faatima Ma'sumah (s.a) of Qum' by Mas'umah Jaffer. 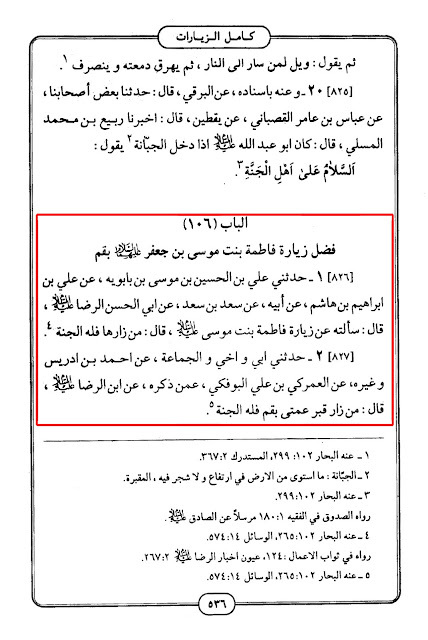 67-1 My father and Muhammad ibn Musa ibn Al-Motawakkil - may God be pleased with them - quoted on the authority of Alee ibn Ibraheem ibn Hashem, on the authority of his father from Sa'd ibn Sa'd who said, "I asked Abal Hassan Al-Rida (a.s) about visiting the shrine of Faatima the daughter of Imam Musa ibn Ja'far. 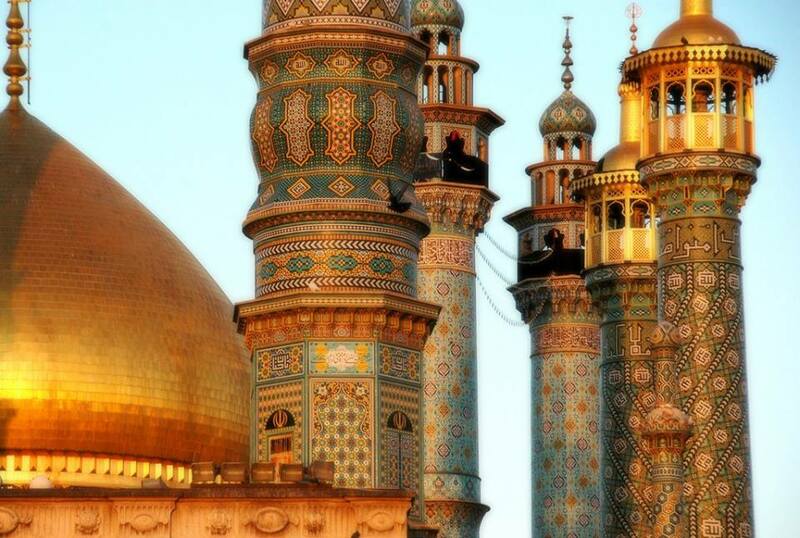 Imam Al-Reza (as) said, "The reward of whomever visits her shrine is Heaven." 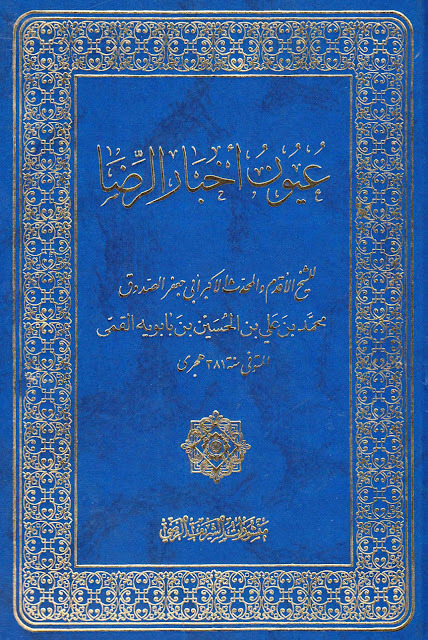 Ayoon Akhbar-e-Raza. Vol. 2, Pg. # 299. 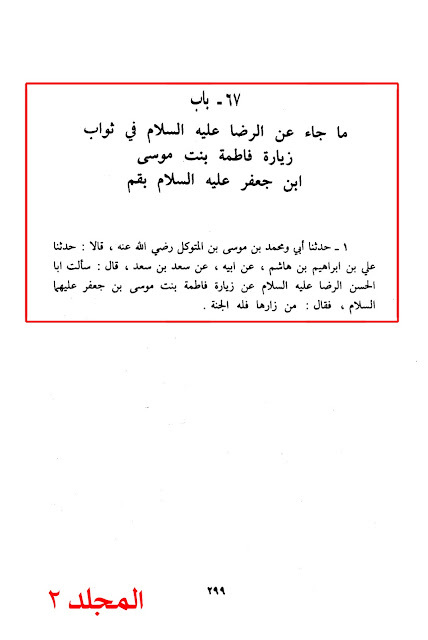 Sheikh Hadi Al-Najafi: Its chain is Saheeh (Authentic). Mawsu'atu Ahadeeth Ahlulbayt (a.s). Vol. 9, Pg. # 195. 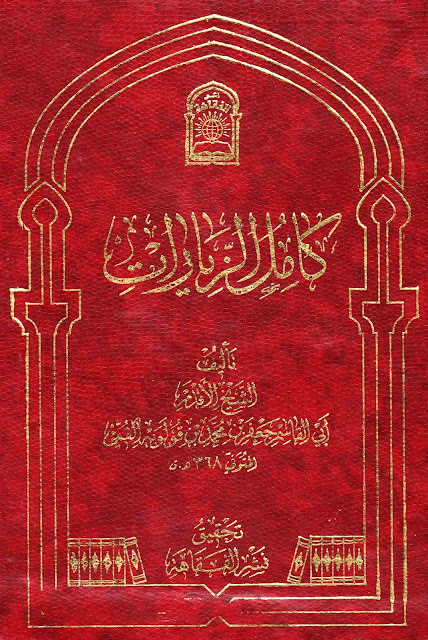 Sheikh Abbas Al-Qummi: It has grade of Saheeh (Authentic). Mafatihul Jinan. Pg. # 807. Narrated to me Alee ibn Al-Hussain ibn Musa ibn Babawayh from Alee ibn Ibraheem ibn Hashem, on the authority of his father from Sa'd ibn Sa'd who said, "I asked Abal Hassan Al-Rida (a.s) about visiting the shrine of Faatima the daughter of Imam Musa. Imam Al-Rida (a.s) said, "The reward of whomever visits her shrine is Heaven." Source: Mawsu'atu Ahadeeth Ahlulbayt (a.s). Vol. 9, Pg. # 195. Narrated to me my father and my brother and a group of people from Ahmad ibn Idrees and others from Al-Imraki ibn Alee Al-Bufaki from someone he named from son of Imam Al-Rida (a.s), Imam Muhammad Taqi Al-Jawad (a.s) who has said: "Whoever visits my aunt [Lady Faatima Ma'sumah (s.a)] in Qum, they will enter Paradise." Sheikh Abbas Al-Qummi: It is Mu'tabar (Reliable). Sources: Mafatihul Jinan. Pg. # 807 and Kamil Al-Ziyarat. Pg. # 536.